The headache, nausea, dry mouth and other discomforts of a hangover can make anyone vow to give up drinking forever. Most people know that a hangover results from drinking too much alcohol, but how much is too much varies widely from person to person. 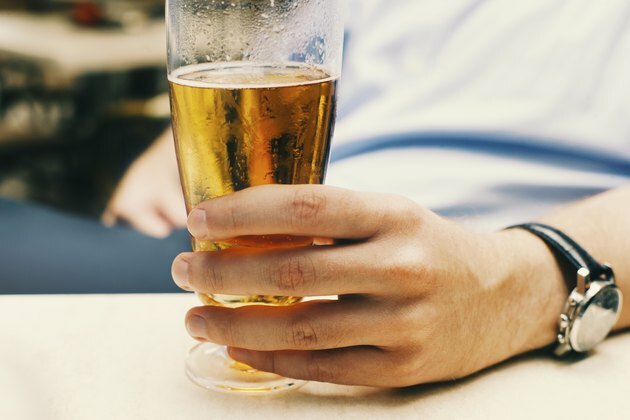 How many beers you're able to drink without suffering a hangover depends on your physiological makeup, your health, your own drinking history and even your family's drinking history. Rhode Island researcher Dr. Robert Swift, of Providence Veteran Affairs Medical Center, studied hangovers and found that mild to moderate drinkers were more likely to suffer hangovers than habitually heavy drinkers. This may be because the body builds up a tolerance to the effects of alcohol. Or it may be that heavy drinkers keep drinking to stave off the pain of a hangover. Dr. Swift also found that if you had a family history of alcoholism, you were more likely to suffer from bad hangovers. Go Ask Alice, a column sponsored by Health Services at Columbia University, reports that for most people, the hangover threshold is five drinks, especially if you consume those drinks in a short period of time, and especially if you drink on an empty stomach. Drinking games, binge drinking and shots can contribute to the problem. One drink equals one 12-ounce can of beer. Smaller people, such as petite women, generally have less tolerance for alcohol. Drinking on an empty stomach increases your chance of a hangover, as does drinking a lot of drinks very close together. People who never or rarely drink are more likely to have a hangover from over-imbibing. Mixing beer with hard liquor increases your chance of getting drunk and, thus, experiencing a hangover, because the carbonation in beer makes alcohol absorb into your body faster. For long-term health, the American Heart Association recommends that women drink no more than one drink per day and men drink more than two. To be reasonably sure of avoiding a hangover, drink moderately and space the drinks out over the evening. Drink slowly, instead of chugging the beer down. Drink water or another non-alcoholic beverage in between beers. Eat a big meal before you drink. Gauge for yourself your reaction to alcohol. If you find you still feel the pain, you'll need to cut back more.